The biggest event in local government takes place in July each year, when almost 1,300 council leaders, portfolio holders, chief executives, and directors get together at the annual Local Government Association conference to discuss key issues facing local government. For 2017, it was very important for us that libraries and their work in communities were part of that conversation. One of the key messages in Libraries Deliver: Ambition is encouraging decision makers to ‘think libraries first’ and events like this are a good opportunity to reach a wide range of different people - many of whom are not immediately involved in the library sector. As we discussed the options, it became clear that the best of chance of getting it on the agenda would be a slot in the Innovation Zone. This is a visually vibrant and creative space, designed to facilitate multiple conversations, demonstrations and presentations from councils that have risen to the challenge of being more innovative – and in turn have reaped successes and savings for their communities. This felt like a really good fit for our goal of raising awareness about the different things that libraries are doing, disrupting the traditional perception of libraries as simple repositories for books, and showing how libraries are delivering against the Outcomes from Libraries Deliver: Ambition. We pulled together a proposal that included a brief introduction from Paul Blantern, Chair of the Libraries Taskforce, and presentations from Jan Holden from Norfolk Library Service on their work with public health, Tabitha Witherick of Somerset Libraries on their Glassbox project, and The Good Things Foundation on digital skills and the role of libraries in promoting channel shift (although, on the day, The Good Things Foundation was unable to attend). In the end, there were over 140 bids for 40 Innovation Zone places, so competition was fierce. Projects were assessed against a range of criteria, including how innovative they truly were (and for libraries, we made the case that more people outside of the library sector needed to know about their work), how much the project has improved outcomes, and how relevant this is to other councils. After a tense few weeks, we were delighted to hear that our bid was approved and due to feature on Wednesday, the second day of the conference. But we didn’t want to stop there. It was unlikely that we would get another direct session on libraries given the demand for other slots (and the need to include space for briefings on the Grenfell Tower fire), so we needed to think a bit more creatively about how to do this. 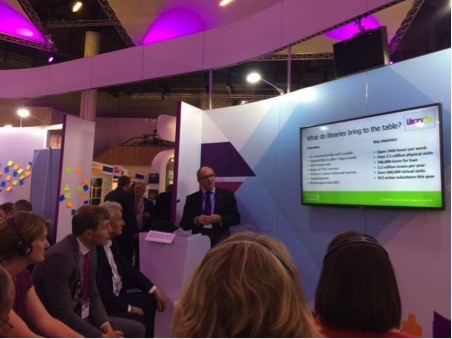 We were therefore delighted to receive an invitation to a morning fringe session on libraries from the New Local Government Network (NLGN), entitled ‘More than Book-keeping? A New Approach to Library Services’. Featuring presentations from Cllr John Hart, Leader of Devon County Council, Ciara Eastell of Libraries Unlimited, and Brian Ashley of Arts Council England, this was an excellent way to start our conference. It was a small session, but the quality of discussion was high, with half a dozen library services all looking to share ideas and thoughts about achieving successful service transformation. One of the fantastic things about libraries is that they act as venues for a whole range of creative activities. Fun palaces, in particular, was something that stood out as an activity that hit a lot of council objectives about community empowerment and involvement. They also have a reputation for being exceedingly lively, fun events, which was exactly what we were looking for to open the Innovation Zone. 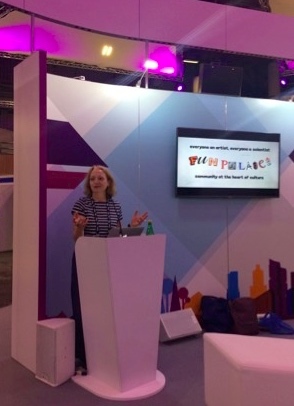 This turned out to be a huge success, with Stella Duffy telling delegates about the fantastic reach and impact of Fun Palaces, and then running a mini session with delegates. It was incredible to see how nervous delegates, perched around the outside of the presentation centre (poised for a quick escape! ), all started creeping forward as the session progressed. Nothing could demonstrate more effectively how brilliant these Fun Palaces are at bringing people together. It ended with Stella persuading one of the delegates to teach the group some basic tap dancing steps! Stella returned for our Cultural Capital session on placemaking and making the most of an area’s cultural assets, alongside the Leaders of Hull, Plymouth and Sutton councils. Her contribution this time included teaching surprised, but enthusiastic, delegates some words of Maori, but also paying tribute to libraries as perfect hosts for Fun Palaces. Her contribution was so inspiring that some delegates immediately started arranging for some Fun Palaces in their areas, which was a great outcome for the session. The Wednesday arrived and our dedicated Library Session – Libraries Deliver - was due. Unfortunately, The Good Things Foundation were unable to attend, but Paul Blantern stepped up to deliver a session on the Library Plus approach in Northamptonshire, so we still had a full session. We were up against full plenary sessions on community cohesion, delivering children’s services, learning from historic failures, and the big trends in public services, among others, so we were a little worried about whether we would get much attention. 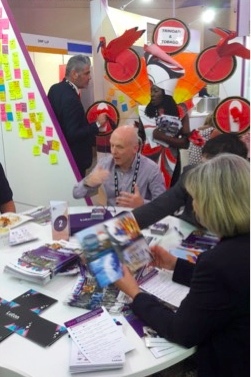 In the end, we needn’t have been concerned – while larger numbers would always be good, we reached particularly interested delegates looking to answer some key questions about their services. We also found that simply having the session on the agenda prompted a lot more questions about libraries at other times, from delegates who hadn’t been able to make the session, so its value in raising awareness shouldn’t be underestimated. After a short introduction about the work of the Taskforce, Jan Holden took the stage to talk about how Norfolk Library Service is working with public health teams to improve the health of their communities, and why that is important for Norfolk Council. Delegates heard that Norfolk has high levels of obesity and dementia, and falls are a major reason for admissions to hospital. This means there are significant potential savings for both council and NHS if these issues can be tackled. 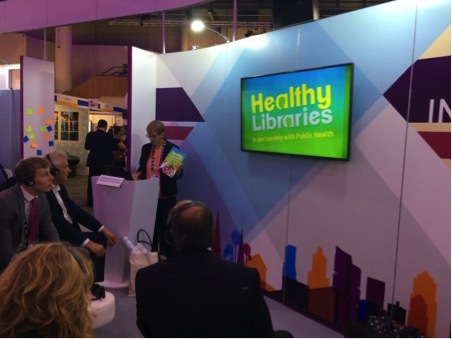 Norfolk’s public health team have seized the opportunity to work with Norfolk’s libraries, given their reach out into the community. Libraries are also trusted places, and staff can perhaps be more honest with regular customers than many other public sector workers could be. Jan went on to describe how they are doing this, including through the use of their public health handbook to keep all their branches on track, challenging staff to be healthier as well as their visitors. Each branch is delivering health activities tailored to their particular community. You can read more about how they are doing this here and here. It was then Tabitha’s turn to talk about the very different work going on in Somerset to promote entrepreneurial skills (although Tabitha, and later on Paul, were also keen to emphasise that they also promote public health in their service). Tabitha talked about the significant cold spots in higher education access that occur throughout Somerset. This is a serious issue for the county, and the businesses within it, so the library service is filling that space. Tabitha also talked about the 43% of Science, Technology, Engineering and Mathematics (STEM) vacancies that are hard to fill, and how the digital skills gap is affecting local businesses. This was a powerful part of the presentation and, as one delegate perhaps naively (but probably representatively) remarked, it is not language and terminology that you would expect to hear from a library service. It was great that Tabitha was on hand to correct that perception. She talked about the robotic kits, 3D printers, and virtual reality devices that the Glass Box has available, as well as the Hackathons and Google garages that are run to improve skills. The presence of an engineer in residence, teaching visitors robotics and building robots, was something that particularly interested delegates. They were also very interested in the fact that local businesses were now engaging with the library service in a very different way, and prepared to sponsor skills development activities in the library. You can find out more about the Glass Box here. Paul Blantern then took the floor again to talk about the Library Plus approach in Northamptonshire. He described how the Library Plus concept pulled together a wide variety of services - from marriage and birth registrations to wellbeing and business and intellectual property centres – into a seamless offer that could be accessed by their communities. Paul described how Library Plus had already held 13,000 leisure events reaching 60,000 people this year, and went on to praise libraries incredible reach into their communities. He highlighted how valuable this information and demographic insight was to councils and said that more should be done to make use of it. For instance, Library Plus has a long-term study with their local university to assess the impact of Library Plus on local health and wellbeing. This information will be invaluable for making the case for continued investment in the service. Paul concluded with the thought that libraries are so integral to our communities and sense of place, that they may well outlast their host councils. Although not something driven by the culture team, there was one other session that had relevance to, and made reference to, public libraries. 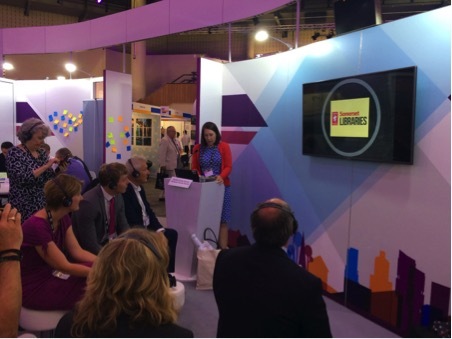 This was the session on creating One Public Estate, bringing together assets from all parts of the public sector to make the most effective use of them. By 2019-20, the programme is now set to generate 44,000 jobs, releasing land for 25,000 homes, raising £415 million in capital receipts from sales, and cutting running costs by £98 million. The session focused on the development of the Mildenhall community hub, which is a shared space with a library at its heart. This was being developed in response to the planned closure of RAF Mildenhall, following the withdrawal of American forces. The presenters were keen to emphasise that One Public Estate is not just about property, but also an opportunity to think about how services aligned more closely/better in an area. Libraries, of course, have some fantastic locations and can offer a lot to other services looking to position themselves in the community – whether that is in an existing space or in a jointly-funded new facility. There are some key concerns, such as ensuring the main library offer is not diluted by services that are not complementary, but positive solutions have been found. For instance, Worcestershire was one of the pilots and has successfully integrated two jobcentres into their library branches, as well as their pioneering combination of the public and university libraries in The Hive in Worcester. You can find out more about the One Public Estate initiative here. 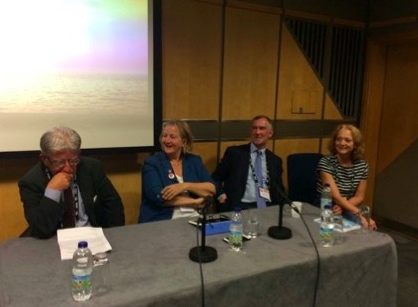 It was really positive to include libraries on the conference agenda, and see leaders and chief executives discussing the role they can and do play in their communities. Particularly interesting was the Chief Executive of a district council, who had been approached by his county to see if they would be interested in supporting their local library. After hearing the presentations, he said he could clearly see the links between their objectives. 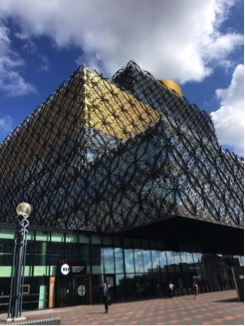 It was also positive to see the many tweets that remarked positively on Birmingham’s new library, and the number of fringe events that took place within it. I hope we’ll be able to build on that when we return to Birmingham next year. To find out more about the conference, take a look at tweets made by @LGAculturesport between 4-5 July.